Volumatic Counter Cache Basic KA Version - standard Volumatic Counter Cache Basic Keyed Alike - same key and key lock supplied with each safe. Key alike version of the Volumatic Counter Cache Basic allows the duty shift manager to access all the safes using the same key - saving time and minimising the chances of not being able to open safes due to keys going missing. Please note that the Counter Cache Basic is the one without the internal cassette & cassette mechanism - if you need the internal cassette please order the . Not sure of the difference between the two? Please see our demo video below, which explains the differences between the Basic & Classic Counter Cache. 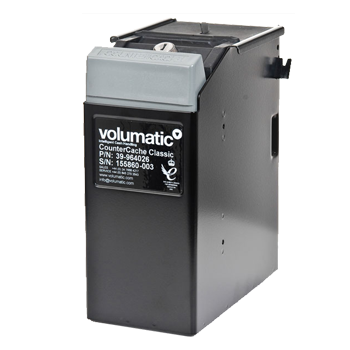 Volumatic basic counter cache is a secure metal container designed to store bank notes at the point of sale. Bank notes that would otherwise build up in the till are stored in the counter cache. 600 bank note capacity means the counter cache can be collected at your convenience.